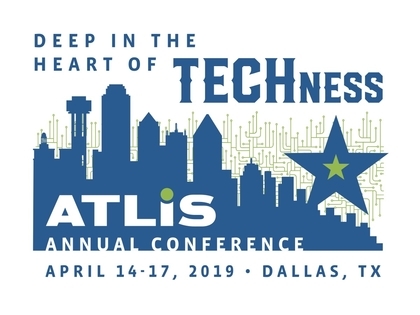 Our Call for Proposals for ATLIS 2019 has closed. Our annual conference will take place April 14-17, 2019, at the Westin Park Central on Dallas’s north side. One registration will enable you to access all of the conference offerings, from Sunday through Wednesday. All proposal submissions have been reviewed. If you submitted a proposal, you should have received an email regarding your proposal's status. Be sure to check your spam folder! If you are a co-presenter, please check with your lead presenter. You may also use access our submission portal for status updates. (You created an account with Reviewr if you originally submitted the proposal for review.) Contact Susan Davis, [email protected], with any questions. For some tips on writing a proposal for our conference, check out Susan Davis’s blog post on this topic or view last year's program. Or take our free online mini-course on “Writing a Conference Presentation Proposal." Consider how the heart can represent human-technology engagement, or how technologies can be vital to school life. We seek proposals that explore how humans and technology are deep at the heart of how we learn. Download our complete guidelines and instructions here. Copy and use our proposal template. 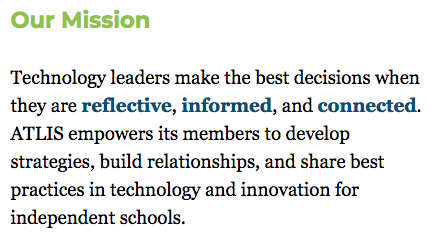 Propose a session that goes deeper into the heart of technology in independent schools. Craft a summary of your presentation (500 characters) idea that clearly identifies your focus, offers solution to a problem, shares a story of innovation, or conveys information on a topics of interest. Settle on two or three learning objectives (300 characters) for your session. What knowledge or skill should your attendees take away with them? Bootcamp (3-hour, hands-on workshop): Bootcamp presenters may register for the Annual Conference at no charge. Deep Dive (1-hour and 45 minute sessions): An ATLIS conference signature, this format allows presenters from two or more schools to share their experience or expertise from differing perspectives; Deep Dive lead presenters (up to 3) attend the conference at a discounted presenter rate. Presentation (60-minute sessions with active, participatory components): Lead presenters and up to two co-presenters attend the conference at a discounted presenter rate. Panel (60-minute session with audience participation): Panel moderators attend the conference at the discounted presenter rate. Jam Session (60-minute sharing session for improvisation, brainstorming, or innovating on a particular topic): Jam Session hosts manage the discussion and encourage participation by all attendees; Jam Session hosts do not receive discounted registration. Share how your proposal connects to the ATLIS Mission. Indicate how your proposal will be interactive -- this is how ATLIS attendees expect to learn.